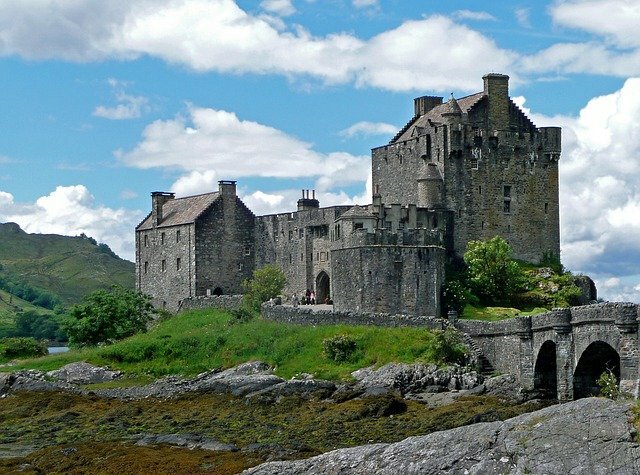 Eilean Donan castle sits elegantly on a small island off the coast of the Scottish highlands, joined to the mainland by an arched stone bridge. 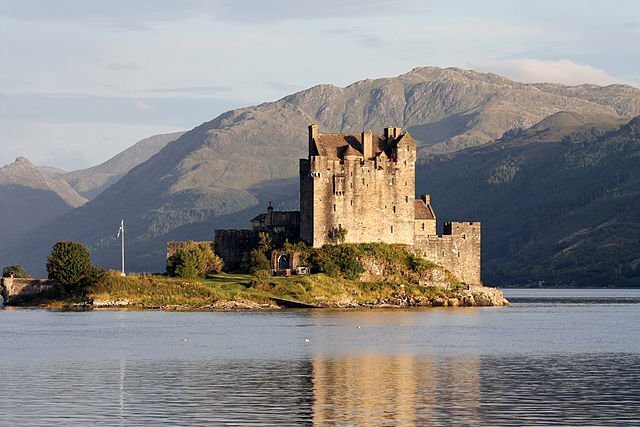 In this lovely spot, strategically and picturesquely located at the meeting place of three lochs, there has been some type of fortification ever since the Iron Age. The history of the original castle probably began some time between 800 and 1200 A.D. 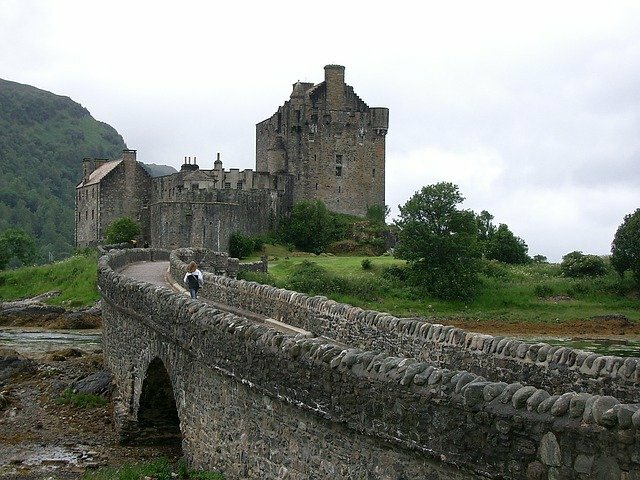 It featured largely in Scotland’s epic warrior legends, providing a hiding place for Robert the Bruce early in the 14th century and a fortress for rebel Jacobites in the 17th century. 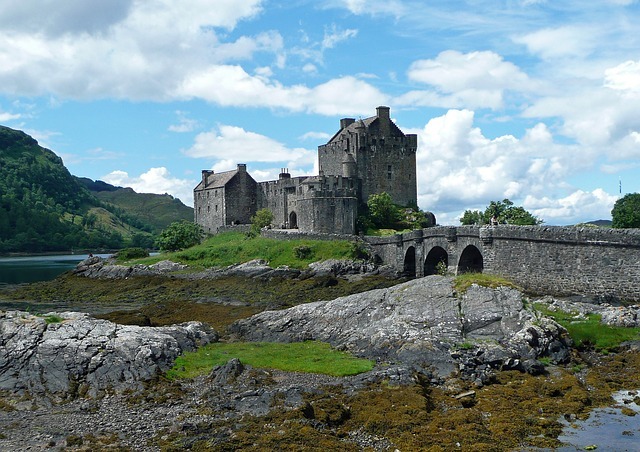 In 1719, due to its role in the Jacobite rebellion, the castle was bombarded and destroyed by the British government. It remained in ruins for 200 years. In 1911, the island was purchased by Lieutenant Colonel John Macrae-Gilstrap. 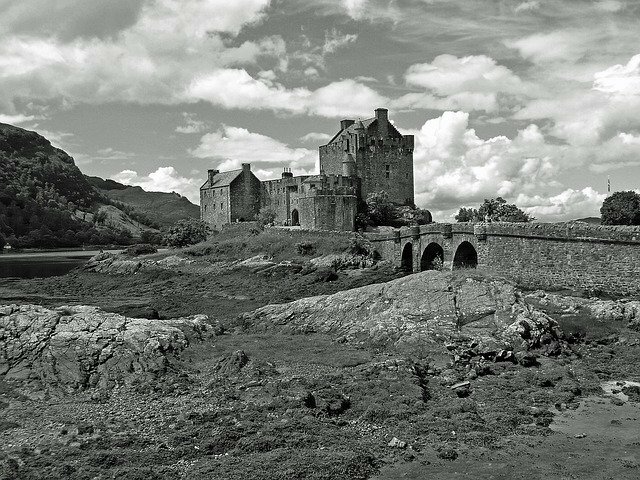 Over the next 20 years, he and Farquhar MacRae, his project overseer, dedicated themselves to the restoration of the castle. The remarkable structure that visitors to the Scottish highlands see today is the result of their vision. 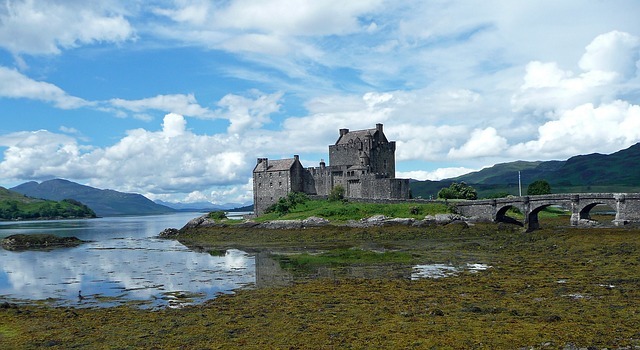 Eilean Donan Castle now appears much as it did in the 17th century. Accessed from an evocative stone arch bridge, the castle is larger than it appears in photographs. 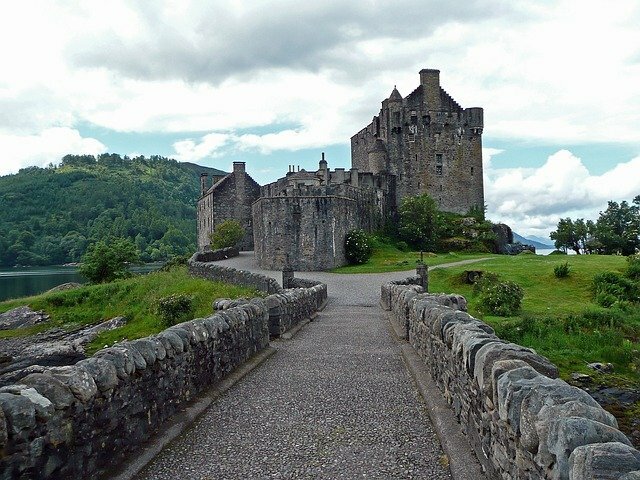 The main gate is fortified with a dangerous-looking portcullis and murder holes — openings in the wall where soldiers could pelt their enemies with stones, arrows, and boiling pitch. 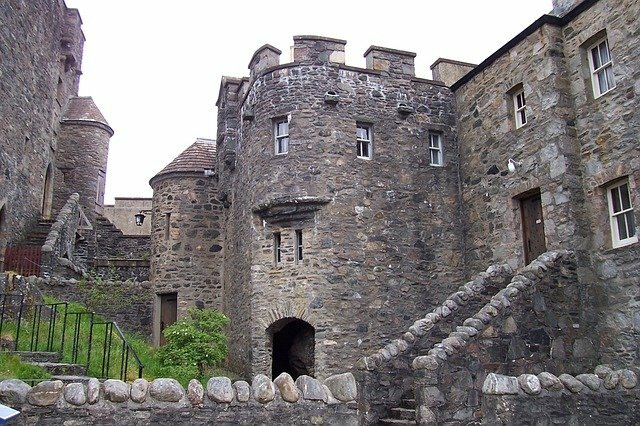 Within the castle courtyard, visitors can enjoy a magnificent view of Loch Alsh framed by ancient stones. Inside the castle keep there are three floors to explore. On the ground floor, the Billeting Room features arched stone ceilings and a tableau of the castle in its planning stages. The next level is home to the magnificent Great Hall, complete with massive wood dining table and equally substantial stone fireplace. Side passages provide entry to the battlements, where views of the castle exterior and the surrounding countryside are spectacular. 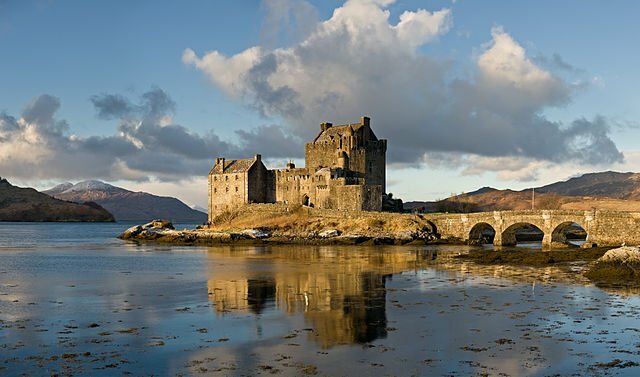 Seen through the mists of early morning or illuminated by the setting sun, Eilean Donan Castle is a romantic, resonant symbol of Scotland’s past — and the gateway to a truly amazing adventure through time.